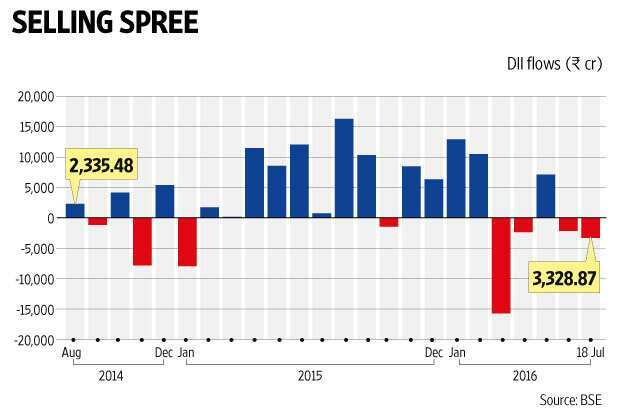 Mumbai: Domestic institutional investors (DIIs) have pulled out more than ₹ 3,300 crore from Indian shares so far this month, with outflows accelerating from a month before, as these investors locked in gains after the recent rally in the market. Data from BSE showed that DIIs withdrew a net of ₹ 3,328.87 crore so far in July, while they pulled out a net of ₹ 2,173.55 crore in the month of June. DIIs mainly comprise of mutual funds and insurance companies, and data from capital markets regulator Securities and Exchange Board of India (Sebi) suggests mutual funds sold a net of ₹ 139.3 crore of Indian shares so far in July. They had sold a net of ₹ 85.9 crore of local shares in June. “Traditionally, this quarter is weak in terms of inflows for insurance companies," said Mihir Vora, director and chief investment officer, Max Life Insurance Co. Ltd.
“Also, a significant amount of insurance companies’ corpus is into traditional funds, and there is a bias towards absolute returns. Profit booking is definitely not ruled out at current levels," added Vora. Life Insurance Corporation of India (LIC), the largest DII, has been selling continuously in the secondary cash market this month, said two officials with two different domestic brokerage firms aware of the matter. They requested anonymity as they were not authorized to speak to the media on LIC’s investment plans. An e-mail sent to LIC after market hours remained unanswered at the time of publication. Mutual funds seemed to be on the sidelines, waiting for the market to dip, or as they lined up funds to invest in upcoming initial public offerings (IPOs). “SIP (systematic investment plan) flows are continuing. Those flows are probably being held back for better price discovery or IPO opportunity," said Nilesh Shah, managing director, Kotak Mahindra Asset Management Co. Ltd.
SIP is an investment vehicle offered by mutual funds, which allows investments of small amounts into their schemes at regular intervals instead of lump sum investments at various points of time. Such investments are mostly carried out on a monthly or quarterly basis. “There is some amount of redemption in arbitrage funds," said Shah of Kotak. On Monday BSE’s benchmark equity index Sensex closed 0.32% lower at 27,746.66 points. It is up 6.24% so far in 2016, and has rallied 20.89% since the 2016 lows seen on 11 February at 22,951.83 points. “It is possible that some investors who invested about 12-15 months ago may have booked profit and want to relook at the markets. Also, the markets have recently seen some IPOs and some quantum may have diverted in such public issues," said Nilesh Shah, managing director and chief executive, Envision Capital Services Pvt. Ltd. So far this calendar year, 14 companies have tapped primary markets. Such companies have raised close to ₹ 9,400 crore since 1 January, showed data by Prime Database, a primary market tracker. Last year, 21 firms tapped the market through the IPO route to raise close to ₹ 13,600 crore, a four-year high, data showed. About 20 firms are in fray to tap primary markets going forward. They collectively have the potential to raise close to ₹ 7,000 crore, as per Prime Database. “Overall sentiment regarding fresh fund allocation remains positive," Shah of Envision added. Wealth managers remain upbeat about inflows into mutual funds, and the prospects of the Indian market in the medium to long term. “People are very positive on equities. People are patient, despite having a bad last year. There is a lot of hope on what lies ahead for the Indian markets," said Raghvendra Nath, managing director, Ladderup Wealth Management Pvt. Ltd.
June quarter earnings have started to trickle in. While the handful of companies that have reported their quarterly earnings showed a mixed performance, companies are expected to post an improvement in profits and sales in the quarter ended June and for the rest of the financial year. Expectations of a better-than-average monsoon rainfall, which has already arrived across the country, has been the icing on the cake for Asia’s third-largest economy which saw two consecutive years of drought in 2014 and 2015.